It’s best to watch the video, so you can see the demonstrations, but we have also written it all out below if you prefer. 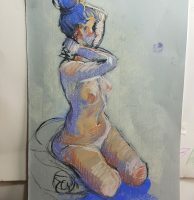 The construction approach to figure drawing is about simplifying the incredibly complex and nuanced human form, which is hard to draw, into simple shapes which can be built up into a figure. It’s easy to know how to start the drawing. Instead of the mass of information that your eyes take in from the figure – all the little bumps, tones and distinctive features – you can see a few simple shapes instead and start with those. This allows you to build the figure while only having to handle manageable chunks at a time. Thinking in terms of shapes rather than human body parts helps you overcome the biggest challenge that beginners face – their brain’s pre-conceptions. It can handle a foreshortened straight line or cylinder or something much better than a foreshortened leg. You can get things in the right place before you add detail. If you have already drawn body parts in detail, it might be too late to start moving things around. You get a sense of the most important patterns of light and dark on the figure. Instead of infinite gradients of tone across the figure, you have simple planes that are facing or not facing the light source. Now, construction isn’t for everyone. For some it feels a bit formulaic, and some artists would prefer to just draw purely from observations of the whole figure. However, it’s not correct to say that construction does not use observation. A construction approach is still based on observation, but it’s a way of making what you observe more manageable. Our recommendation for you as a beginner is to practise this approach and do these exercises. It’ll be a starting point for your drawings, and you can move on from this approach later if you wish. Remember we are working on training your eye and taming your brain, and this will be really useful for that. There’s many ways to approach construction, and you may end up developing your own preference. Here we outline ours, which we feel combines simplicity with usefulness. The approach differs a bit depending on what angle you are viewing the pose from. We like to base our construction process on visible landmarks – so that you can clearly see the lines and points on which to base your structure – rather than having to imagine them. We don’t also rely entirely on super simple shapes like cubes, cylinders and spheres. Sometimes these simplifications are too far from what you’re seeing and when you still learning they can actually confuse things a bit. For this first lesson, we are going with poses viewed from the front. So for the first stage of our construction we are basically creating a really advanced stickman – lets call it a superstickman. We are going to start with the head. We will draw a simple shape like a pointed oval for now, just to get the head down. We’ll do it with two or three simple curved lines that start at the top of the head and curl down to the chin. Mayko here is using three lines – one across the top and then two curling around each side. There’s many ways to do this. Don’t panic about doing it the ‘right way’ – these lines are just supposed to help you, not stress you out. We’ll also put on two dissecting lines around the head. A centre line right down the middle of the face – down the middle of the forehead, along the nose, through the middle of the mouth and to the tip of the chin. Then another running across the eyebrows to the tops of the ears, around the head. With just these two lines it’s clear which way the head is pointing. Next, we are going to draw in a v-shape for the front of the neck. 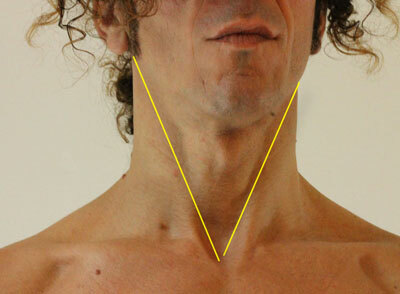 Can you see how people’s necks usually have this v-shape running around their throat – pretty much from the bottom of the ears to the middle of the collar bones? We are just going to look at that v-shape on the model’s neck, it might be twisting to one side or the other, and put that in for now. If you can’t see it in the pose, for example it’s hidden by the head, don’t worry about it! Now we are going to put in the centre line of the front of the torso. Just lightly – we’ll probably have to fix all this later. This should start from the bottom of that v-shape, run down between the pectoral muscles down the sternum (the middle of the front of the ribcage where all the ribs meet), solar plexus, down the middle of the abs through the belly button and all the way curving down to the groin. Then we are going to draw the line between the top tips of each shoulder. If you like you can keep this straight, so just a straight line from the top edge of one shoulder to the other. But if you can, try to run it along the collar bones, which are usually visible and clear. These collar bones move and can become v-shaped themselves depending on what the model is doing, and it’s useful to roughly get that shape in even at this early stage if you can see it. The collar bone lines will start at the bottom of the v-shape we put in for the neck. Try feeling one of your own collar bones from the middle of the top of your chest and the bottom of your neck, along to the hard tip of the shoulder. If you’re viewing the pose from the side, you might not see both shoulders – in this case we have a different procedure for you in a later video – for now we are talking about poses from the front. If you can’t see both shoulders in a pose because one of them is covered up, for example by hair, then you can try to imagine where you think it is, and make your line accordingly. Don’t worry if it’s wrong, everything will be refined and corrected as we go! In fact, as we’ll find out from another lesson, our drawings at this stage of our learning are going to come from incorrect lines which we notice don’t look right and then fix. Next we are going to put in the line between the tips of the pelvic bone. These are usually nice visible landmarks on any figure. Try feeling these bony bits on either side of the front of your waist – at the level a belt would be. Your line should run between those two points. You can do this as a straight line for now, or if you are feeling confident, do it along the curve of their waist – imagine if the model was wearing a pair of underpants. Where would the top line of those underpants run? Often in standing poses you’ll notice that the lines between the shoulders and pelvic bone counteract each other. If one is tipped one way, the other is tipped the other way, to keep balance – so observe those two angles carefully. Now we can add in lines for the legs – these will run from the ends of our line running across the waist down to the knees, then another down to the ankle. For the feet, you can put in a triangle placeholder or just a line to indicate the general direction for now. We can add similar lines for the arms – one from the shoulder down to the elbow, then for the forearm running from the elbow to the wrist. For the hands again a triangle placeholder or just a line, running in direction of the hand is enough for now. If you struggle to just draw in the lines of the the arms or legs, maybe because they are in a tricky position, it might help you to first locate the hand or foot, and then the elbow or knee, and then simply connect them together. All these lines are going to need to be adjusted. We won’t stick to them, we’ll correct them as you start to understand the pose more later in the drawing. It’s interesting, but even though our eyes take in the pose instantly, it takes time to actually understand it because your brain needs to process the information. As you get more experienced, your processing speeds will improve dramatically. For now, it’s totally fine if these initial lines are a bit wrong. The drawing process for learners like us is to put down some wrong lines, learn to recognise that they are wrong, and then put down some lines closer to the truth, and keep fixing the drawing until it looks right. The first way we are going to practise is again with newspapers. 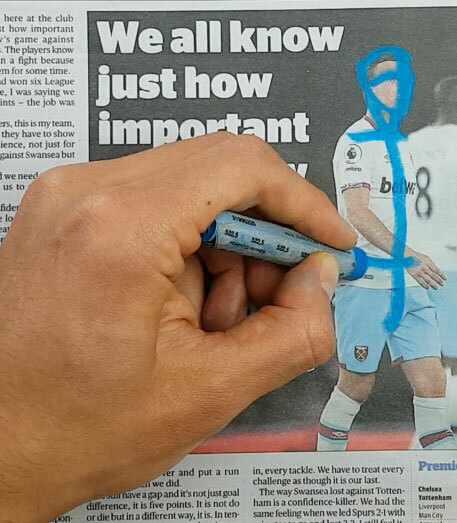 We are going to draw straight on top of the photos in the sports page. This is to get us used to drawing these lines without worrying too much about proportions and angles. It can be a little tricky since they’re wearing shirts and some visible landmarks are covered. Generally though, we can still see all the points we need. Be careful not to be distracted by the lines of the clothes. Here for example, I’m way off with my pelvic bone line because my eye was taken in by the line of his shirt. Remember it’s good to use something like charcoal or pastel that makes strong marks on newspaper paper. 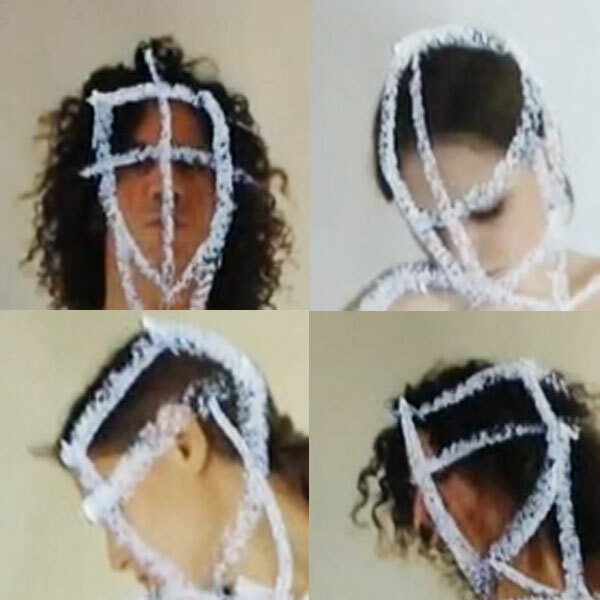 So we are going to draw around the heads, from the top to the chin on each side. Then the centre lines of the head. Then the V of the neck, centre line of torso, the shoulder line or collarbone lines, the line between the tips of the pelvic bone and then the legs and arms. We are now going to move away from the photo, but not far! We are going to draw the stickman next to the photo. Lets keep the size the same as the photo for now. Most of the photos in the newspaper will be front views, so that is good for this lesson. 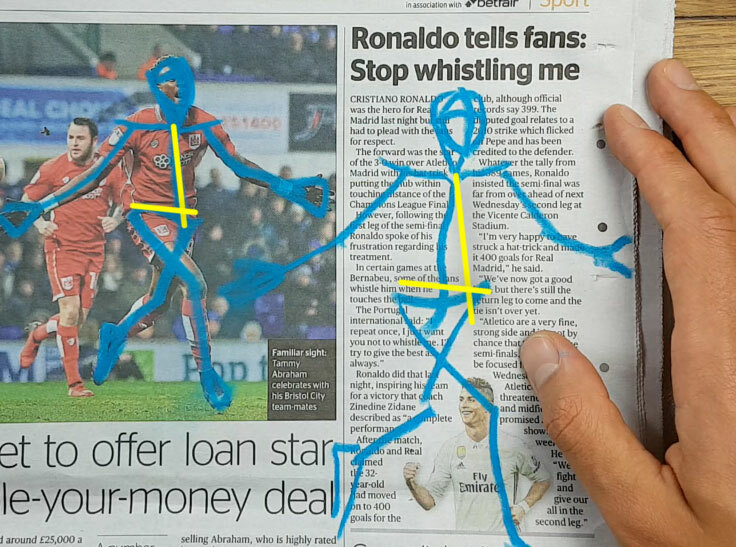 We can draw directly on the photo before our attempt as well, to help us with our stickman. Or we can draw it straight onto the photo after our attempt, to give us something to compare to. This is a nice little exercise you can add to the movement exercise we did in the previous module. In the example below, I first did the attempt at a superstickman on the right. I then did it straight onto the photo, and only then realised that I had done the torso centre line and the pelvic line at the wrong angles. The last exercise we are going to do is to draw our superstickmen from reference photos. We should do these on scrap paper. They’re not precious drawings, they’re training. I’ll put up a drawalong video, which will be an hour long video where we will look at some reference photos and draw our stickmen together. That’s it for this lesson. In the next lesson in this module, we are going to start practising the building blocks we are going to use to add mass to our stickman. Ok so we have started to see important lines that define a pose and even started capturing those to create superstickmen. Once you’re comfortable with the exercises, you can move on to the next lesson, which is about the ribcage and pelvic area which we will use to add mass to your stickmen. You’re doing great – lets keep it going! If you’d like to receive regular tips and bits of motivation, subscribe to our email newsletter below!